A conservatory designed correctly, provides a striking exterior to your property as well as an exciting extension to the interior of your home. A flexible addition what ever style of conservatory you choose – a conservatory offers additional space to use all year round. Quality conservatories are built with the surrounding architecture in mind. A complementary design from Conservatory Online Prices will blend seamlessly with your home. Give your home a make over with additional space that’s welcoming and user friendly. Before deciding to install a new conservatory, ask yourself the key questions. What size do I need? What is the function of my new conservatory? Which style will best suit my home? There are many factors to consider when looking at conservatories. Size, style and function are just some of the things that need to be thought of. A big home investment, choosing a conservatory is of course not easy. 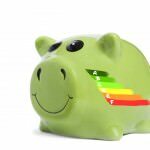 Budget must also play a deciding factor but here at Conservatory Online Prices we can guarantee we have a conservatory that answer all of your questions and meets your budget. 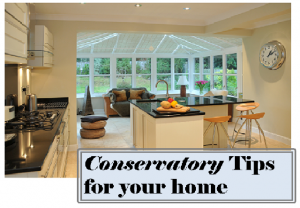 Our conservatory tips will help make sure you get the exact conservatory you are looking for. Conservatory tips number one: how to use your conservatory. You will be faced with many style and build options. In order to choose the right conservatory, you will want to question why you are installing a conservatory in the first place. How do you plan to use your extension? Functionality is key. Maybe it’s an extension to your garden rather than your home and you wish to grow plants in there. whatever it’s purpose we will help you choose the design that’s right for you. What do you hope to get out of your new room? A study, playroom, office – these are all great ideas. Even if your conservatory is simply a place to relax in, you will need to determine which style of conservatory will accommodate for your needs. If you imagine yourself enjoying alfresco dining and entertaining in a large and light space then you might want to consider adding a conservatory to your kitchen. Create a Mediterranean ambiance to your kitchen by bringing the outdoors in – perfect for entertaining family and friends. A kitchen conservatory offers an open circuit where everyone can wonder. Not only will this bring you a light and relaxed atmosphere but it will also provide you with an informal area for you to cook dine and entertain. If you are not a fan of having a conservatory directly off your kitchen then you may prefer a dining room extension. Just like the kitchen extension, this style will provides a unique experience for dining. A dining room conservatory will transform your eating area into a bright and spacious room. The sitting room has always been an important feature of our homes. Throughout the centuries it has transformed from an open plan hall to a drawing room and eventually what we know today as the lounge or TV room. A sitting room is one of the most used rooms in the house. A sitting room conservatory can be styled in any fashion and whether that’s with conservatory furniture, or more traditional living room furniture, this style will provide the perfect space for family gatherings. Office conservatories are becoming more and more popular, with people now working from home. This style offers a refreshing alternative to the standard back room in the home. Who wouldn’t want to work from home with a view on to their garden? Conservatory tips number two: get up to speed on building regulations and planning permissions. Your build will be discussed prior to drawing up official plans. Things like positioning, glazing and materials will need to be decided upon. Building regulation will not apply if your conservatory is at ground level, less than 30 square metres or glazed with an external door linking your house and conservatory. The position of your build is important. Those with South facing properties will receive a generous amount of sunlight during the day. A conservatory which is South facing will need added ventilation and conservatory blinds. This isn’t to say a North facing conservatory will be missing out on natural sunlight as your conservatory will retain heat throughout the day. The biggest selling point of conservatories is glass. Glazing comes in various styles and advancements have been made to ensure glass is as energy efficient as possible. Your installer will offer you a wide choice of glass designs. The glass you choose will be dependent on the use of your conservatory and more obviously, your budget. The materials you choose for your conservatory will have a lasting effect on how long it lasts as well as how good it looks. Frames are usually made from UPVC and Polycarbonate, however other materials such as aluminium are also popular.Hard wearing materials such as UPVC are chosen for their durable design. Their low maintenance qualities make them very attractive to those with busy lifestyles. Installing a UPVC conservatory will save you time and money when it comes to up-keep and maintenance. No painting or varnishing will ever be needed – just a quick wipe with a damp cloth every now and again will make your conservatory looking as good as new. You will need to know the dimensions of both your home and garden in order to get an idea on the proportion of the room. Don’t sacrifice your garden space for a large conservatory, that might be too imposing on your property. Get the balance just right between outdoor and indoor environment. The size of your conservatory can also depend on what you will use it for. 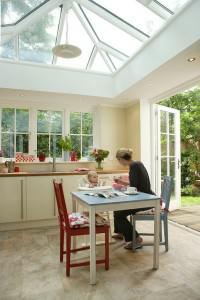 If you are looking to extend your kitchen, then you will need a bigger size conservatory. By establishing the purpose of your conservatory, you can choose the right size for your needs. Perhaps a small lean-to conservatory will make the ideal space for just relaxing in. Your installer will discuss dimensions before any internal measurements are made. Conservatory tips number three: select a conservatory style that’s right for your home. Choosing your style is the fun part. Once you know the purpose of your conservatory you are free to choose from our eye catching designs. You will find a range of conservatories for different properties, gardens and budgets. Our most popular conservatories include Victorian conservatories that mirror traditional architecture with the choice of 3 or 5 facets, Edwardian conservatories which are great or a contemporary and spacious design, gable ended conservatories offer a grand appearance with their high apex and lean-to conservatories which can be made to suit almost any property. The choice is yours. Browse through a multitude of conservatory styles using our online conservatory prices calculator. Get instant conservatory costs and prices. Conservatory tips number four: budget, budget, budget. You don’t necessarily need to have a lot of money to benefit from a conservatory. There are many different styles and deals out there that accommodate for smaller budgets. As mentioned above, there are a variety of factors that will determine the overall price of your new conservatory. Designs, colours, doors, openings, labour, heating and electrics will all naturally increase the price of a very basic conservatory build – but you will receive value for money with Conservatory Online Prices.